A three night pre inaugural of this magnificent new ship was just enough time to see all of the highlights of this innovative vessel but not enough time to enjoy all of her many charms. I carefully read and studied before my trip and I was skeptical that I would like her as much as I did the Voyager Class. After a couple of days, however, I was smitten by the Oasis. Who will love this ship…..the young and the young of heart. With activities for cruisers as young as six months and options as varied as zip lines and gourmet dining this ship is a dream come true for multigenerational groups. The two story loft accommodations exude romance and would be perfect for honeymoons or special occasions for couples who want lots of options and activities. This ship may not be well suited for people who do not like to walk quite a bit and those who do not embrace technology. The innovative touch screens aid in both navigation and options. Overall I found this ship as easy to maneuver as the smaller Royal Caribbean ships which I have always found user friendly. Choosing a cabin with so many options will require some thought and careful consideration. In addition to the traditional options and the unusual promenade options there are now what are essentially “city view” options of bothCentral Parkand the Boardwalk.Central Parkhas a city hum that is adequately controlled by the tight fitting door. The vibrant Boardwalk is more rambunctious and not contained by a door so is more suited to the late night crowd. I liked the inside cabins with a window and window seat but once again the ones overlooking Central park are more serene and better suited for relaxing. I would prefer a CV cabin to a park view balcony, C1 & C2. The PRs overlooking the Promenade are great for watching the activities and shows but are better utilized by those who do not retire early. One of my favorite cabins was the Family Ocean View, FO, forward and high overlooking the helicopter pad. I really like the extra floor space for cribs and strollers or just for kids to play. Lower forward, F, should be considered partially obstructed even though it is not noted in deck plans. The lifeboats are secured into position so that they are always ready for use. The lifeboat drill is unusual in that there are no life jackets in the cabins or in plain sight. This caused some concern. Standard cabins have an S curve and remind me in size of E categories on the other ships in the fleet. Storage, however, is even less and is VERY limited particularly in the bath. Electric plugs are in a very inconvenient spot under the desk so packing a power strip will save aggravation. The ship is technology driven in that the flat screen TV in your room is your source of information for reservations, shore excursions and your on board account. You check into the shows using your sail and sign card via a hand held scanner. The gym and jogging track are impressive. The spa is very nice but the treatment rooms do not have sea views. There is a teen’s area in the spa. There is not a single quiet area overlooking the fan tail and there is not an outside oceanview dining option at the Windjammer or at any other venue with the exception of the Solarium. Word of warning regarding the water shows. For the performances the first 6 rows can get wet. For the fountain shows depending on the wind any of the chairs can expect moisture ranging from a mist to drenching. Guests who pre reserve shows, restaurant and spa appointments will be glad they did. Even if you just save time on the ship for lounging by the pool it is worth it. I had someone tell me this ship has pets on board, it is actually a toy store “Pets at Sea” where kids can stuff and dress a large assortment of stuffed animals with accessories available for purchase. The ice cream in the ice cream shop is made on board and is available in the main dining room at dinner. Forward just behind the Solarium is a quiet area for sunning. The Diamond lounge is VERY nice but a little hard to find. It overlooks the promenade, one deck up, forward, starboard. Wastewater management is state of the art. There is an aggressive recycling program on board…..there is even an entomologist on board to care for Central Park. Food and service appear on par with the other ships in the fleet. There are, however, more specialty restaurants including sushi. Entertainment is more varied with not only more venues but some unexpected features including a bagpiper inCentral Park. Deck 15 overhangs by over 6 feet so balconies under this are shaded. Bottom Line…..there is plenty of gee whiz but it is not ostentatious. 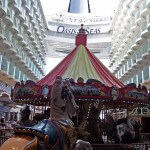 Past Royal Caribbean cruisers who want lots of activities and options will love this ship.